The examination wasn’t bad. The idea of it, perhaps, was worse. When you’re sick, your doctor might order an MRI, CT, PET, EKG, good old X-rays or any of dozens of new medicines. That alphabet soup of diagnostics may give you pause, especially when a simpler thing may work just as well. With the advanced technology that hospitals have, simple might seem contrary but Ofri says that listening, from a doctor’s standpoint, is not just a matter of hearing a list of complaints. It’s “a diagnostic tool and … a therapeutic tool …” requiring the work of two to be effective. Because body language can speak volumes, listening is also sometimes done by the eyes. But listening goes both ways and the words a doctor says and they way she says them “can have a potency comparable to the medications we prescribe …” Patients must closely listen to what their doctor says in order to self-care and heal at home. Here, Ofri believes, is where body language comes in: sometimes, patients may give nonverbal clues or reasons for “noncompliance.” Perhaps they are embarrassed, fearful, can’t afford care or don’t have access to it, can’t read instructions or don’t understand them enough. They may not know their diagnosis, or even their doctor’s name. “What Patients Say, What Doctors Hear” is a book that makes you want to hang on to every word. Obviously, Ofri is good at communicating, even though she admits here that there were times when she wasn’t. 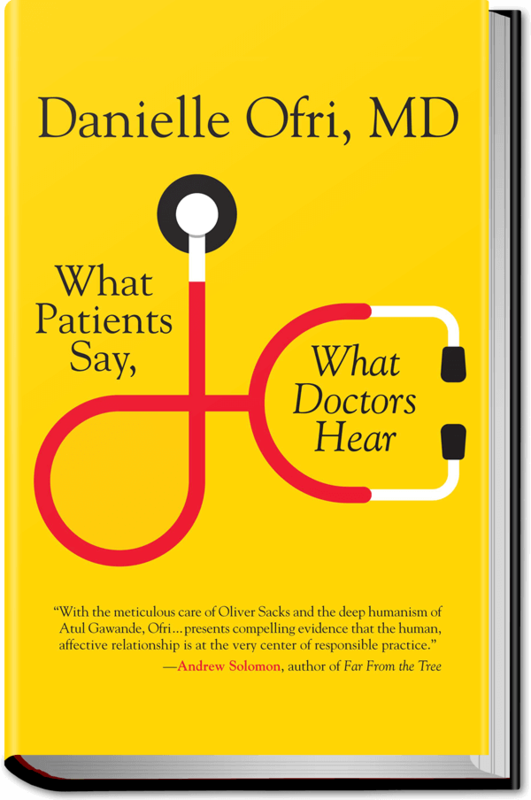 That’s one of the best parts of this book: Ofri not only uses herself as an example, but she spent months interviewing doctor-patient pairs in order to understand the importance of listening in a medical setting. Readers get real-life stories to illustrate the points Ofri makes, told in language that’s authentic but that doesn’t require a Ph.D. to grasp. We’re also given subtle advice on getting (and giving) the best care possible through listening and communicating. This is the book you want to read in the waiting room at your next doctor’s appointment. It’s the one you’ll want to take to the next medical conference. In both cases, it could make a difference: With “What Patients Say, What Doctors Hear,” it’s your listening skills you’ll be examining.